said caching computer further including a network cache memory in its permanent storage memory, means for a digital digest and means for comparison between a digital digest on data in its network cache memory and a digital digest received from said packet-switched network through said gateway. The interpretive issue is whether the “two other computers,” could be any two computers, including the caching computer recited in claim 6 immediately after the gateway. 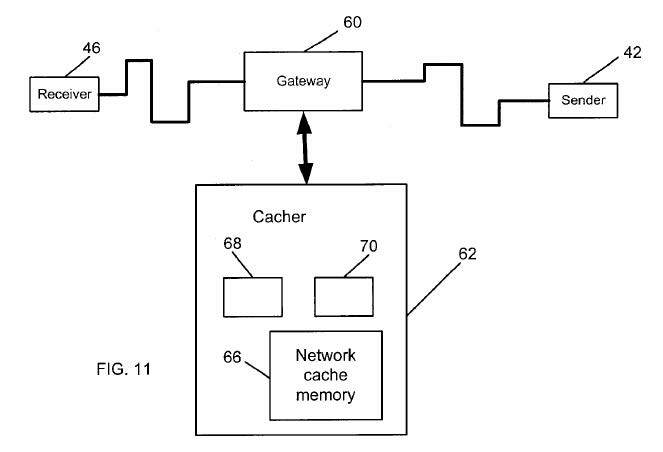 This interpretation is important because the asserted prior art arguably included a gateway connected to at least one other computer and the caching computer, but not a gateway connected to receiver and sender computers and a caching computer. Microsoft argued for the broader interpretation, which included the caching computer as potentially one of the two connected computers. But ProxyConn argued for the narrower interpretation that the “two other computers” referred only to the sender and receiver computers. The Board adopted the broader interpretation, and decided the prior art rendered such claims unpatentable. The Board erred in concluding that the “two other computers” could include the caching computer. Beginning with the language of the claims, claim 6 recites a system comprising a gateway, a caching computer, and “two other computers.” ’717 patent col. 10 l. 54–col. 11 l. 12. Not only are the “two other computers” recited independently from, and in addition to, the gateway and caching computers, the word “other” denotes a further level of distinction between those two computers and the specific gateway and caching computers recited separately in the claim. For example, the specification states: “Gateway 60 is connected to a wide-area packet-switched network in such a way that network packets sent between at least two other computers 42 and 46 pass through the gateway 60. The caching computer 62 uses a part of its permanent storage memory for network cache memory 66.” [cites omitted] (emphases added). As shown in referenced Figure 11, the “two other computers 42 and 46” in this passage are the sender/computer and receiver/computer, respectively. Read together with labeled Figure 11, this portion of the specification makes clear that the gateway, the caching computer, and the “two other computers” are each separate and distinct components of the overall system. The Board’s construction, which expands the “two other computers 42 and 46” to include the separately identified caching computer, is unreasonably broad in light of the language of the claims and specification. The Federal Circuit supports the PTO’s adoption of the broadest reasonable interpretation (BRI) standard for IPRs, consistent with Cuozzo. It will actively provide guidance on what constitutes a proper BRI for IPRs. A BRI determination may be guided by analysis of the claim language and the patent specification, including the drawings. We will explore more about the claim constructions and decision on the Patent Owner’s motion to amend in future posts. This entry was posted in America Invents Act, Broadest Reasonable Interpretation standard, claim challenges, Claim Construction, Federal Circuit, inter partes review, prior art, PTAB, PTAB Patent Trials and tagged AIA, appeal, Bianchi, BRI, broadest reasonable construction, federal circuit, inter partes review, IPR, issued patent, litigation, patent reform, patent trial and appeal board, PTAB, reversal of claim construction, Tim Bianchi, unreasonably broad construction. Bookmark the permalink.